Our vinyl patio covers are manufactured from 100% commercial grade virgin polyvinyl chloride (PVC) that is proven to outlast wood patio covers in quality and durability for a lifetime! Our pergolas come standard with galvanized steel inserts in all support beams and support posts, which provide dependable and lasting stability that you can’t get with a pergola that uses all wood inserts. 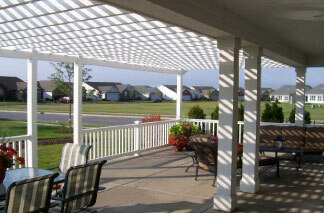 You’ll not only save time and money through the life of your vinyl pergola from VinylPatioKits.com, you will easily add lasting, maintenance free value to your home. Maintenance Free Yes No. Requires painting, staining, treating, repair and replacement. Free of Harmful Chemicals Yes No. Wood may contain Arsenic, Lead or Creosote, all known carcinogens. Price Initial investment is greater. No replacement or maintenance costs. Initial cost less than vinyl. Costly maintenance, repairs and replacement. Don’t be fooled by cheap imitations and don’t risk flimsy construction! Do not require annual staining or frequent maintenance Guaranteed! Are quality from the inside out.